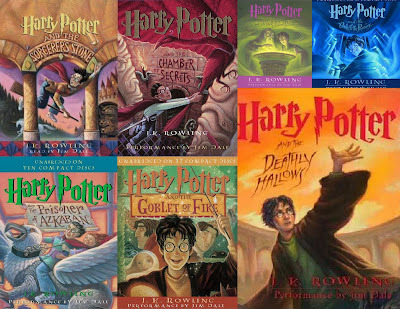 Harry Potter and the Audiobook Adventure – my books. my life. Jim Dale, will you please narrate my life? This summer/fall, I listened to the entire Harry Potter series. It was kind of amazing. I have read this series multiple times. I always enjoy it, but listening to the books made the series even more magical. It was so much fun taking this journey with Jim Dale. He provides wonderful voices and really illustrates some of the character traits I miss when I read it myself and adds traits that are just perfect. (Hermione’s “Harryyyyy” and Draco’s drawl for instance). At times it was like reading the series for the first time. If you’ve never listened to the series, give it a try. I don’t think you’ll be sorry. The first time I read Deathly Hallows, I wasn’t terribly impressed. But the more I read it, the more I like it. And I’ve grown to love just how beautiful the story is at the end. From the time Harry dives into Snape’s memories, into the forest, and through King’s Cross. That is really just some good story telling. But ugh, the epilogue. Can we please still pretend it doesn’t exist? You can’t always think that hard about Harry Potter. Sure, it seems illogical that someone had to put Harry through the TriWizard Tournament just to get him to the graveyard. But what would Goblet of Fire be without it? The angst in some of the middle books seems to get worse over time. I am still in the middle of The Prisoner of Azkaban, narrated by Stephen Fry, but I love it. And I agree, it is like discovering the magic of the series all over again. And the Deathly Hallows is very powerful in the end isn’t it? I secretly always hope she will let Snape live this time around..
And I want to pretend the epilogue doesn’t excist! I have always felt either no epilogue, or at least one that is worthwhile. I secretly hope they will make it more worthwhile in the movies. I think maybe I should read Deathly Hallows again. I read the whole series for the second time for the release of Deathly Hallows and I think that perhaps that is where I went wrong. I like continuity of style and events in series books, even if that makes it seem like it might be boring. But because DH was sooo different in the story–no Hogwarts, for instance–I didn’t like it. And, like you, the Epilogue I think was half the reason I dislike this book–if I reread it, I will not read the epilogue again. This is my third time through Deathly Hallows and I like it better each time. You should definitely try rereading it. I love listening to these books. Jim Dale is awesome. I’ve been dying to try Fry’s version too, but I think Dale might already be my permanent voice for the HP series, so it would be weird. I want to reread the whole series next year (again) before the final movie comes out. I can’t wait to dive back into the series. I notice new things each time. I’d like to try the Stephen Fry ones but I agree that it might be hard to make the switch. I love Jim Dale so much. Glad to know that you loved the audio version of Harry Potter, Michelle! I was extremely disappointed with the ‘Deathly Hallows’, but the revelation in the end redeemed it a bit. But I think I am still disappointed. But as you have written, it might improve on multiple readings – maybe I will read the Harry Potter series again sometime. I have this feeling (pardon me for saying this) that the early books in a series are typically wonderful and the quality of the stories somehow peters out in the end. I loved the Harry Potter series till ‘The Order of the Phoenix’ but then after that I felt it went down – eventhough there were a lot of revelations which came out in the last two books. I also remember reading the Bartimaeus trilogy by Jonathan Stroud (the first book is called ‘The Amulet of Samarkhand’). The first volume was awesome and it is one of my alltime favourite fantasy books. Then it hit the ground with a thud in the second and third volumes. I absolutely adored the Harry Potter audio books. Jim Dale was the perfect narrator for this series and is now one of my favorite narrators! I’ve tried the Harry Potter audiobooks a couple of times and have never really been able to get into them. I don’t often like listening to something I’ve read or vice versa! I have re-listened to the audiobooks as much, if not more than I have actually read the books. I absolutely love Jim Dale’s voice, even though some of his impressions make me giggle. I agree with Dobby…that part chokes me up every time. Will you be seeing HP and the DH at midnight? Yeah that Goblet of Fire loophole is probably what kills me most about the fourth book (my least favorite). I love the epilogue, though. Absolutely adored it. I’ve never listened to these on audio and despite everyone saying how good they are, I can’t imagine I ever will. I’ve read them so many times I already have an internal soundtrack – what each character sounds like, the tone of their voice, the shift in words, etc – and I don’t want that changed by an audiobook! I think I’ll still be able to read the books my own way. Just like the movies haven’t spoiled them for me. But I understand your hesitation. I definitely want to try audio next time I go through this series. I’m not usually drawn to audiobooks, but I love this series so much I’d love to find another way to bring that world to life. Jim Dale is my audiobook hero!